Here is our customer’s 2012 Jeep Wrangler with black and milled 20 inch Fuel Maverick D538 rims. The pictures show it all. It is a great set up and the color scheme between the Jeep and the black Fuel Maverick wheels are perfect. They really complement each other. 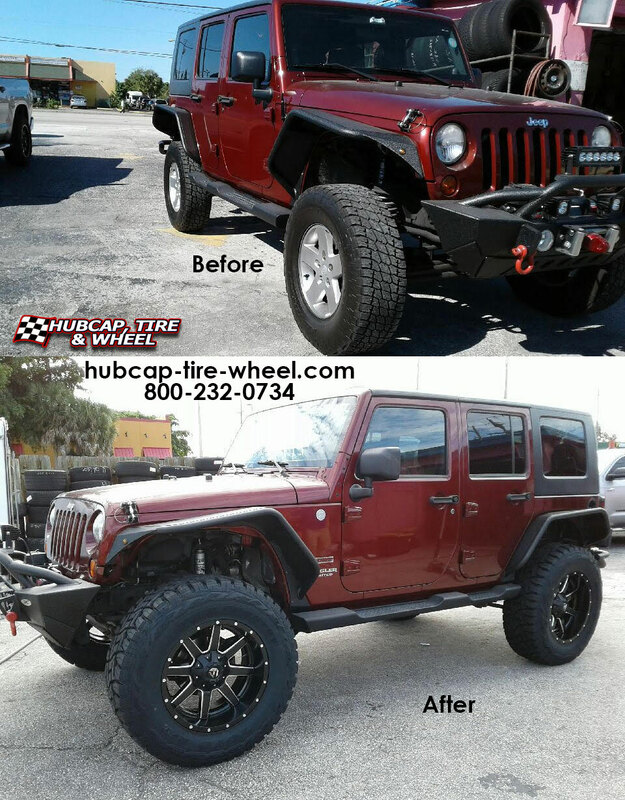 You can see below with the before and after pictures the different custom wheels make on a vehicle. It doesn’t even look like the same Jeep. Custom wheels can completely change the look of your vehicle without having to do all the modifying if you don’t want to. 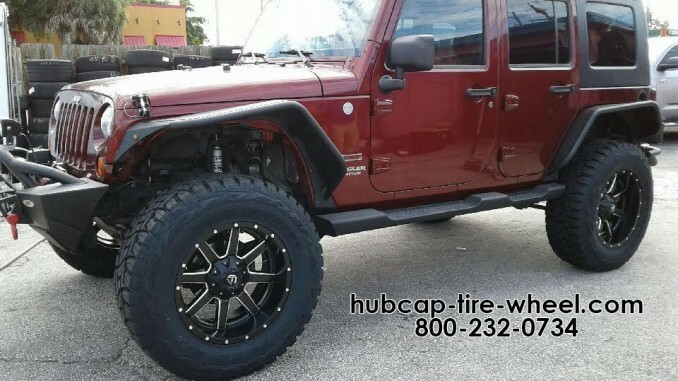 If you’re looking for a custom wheel set up like this for your Jeep Wrangler, get a hold of us and ask us questions. We are here to help you with all of your questions. It doesn’t matter which type of vehicle you have or which wheels and tires you’re interested in, we can help. You can call us any time Mon-Fri 8:30am-6pm EST and Saturday 9am-4pm EST at 800-232-0734. 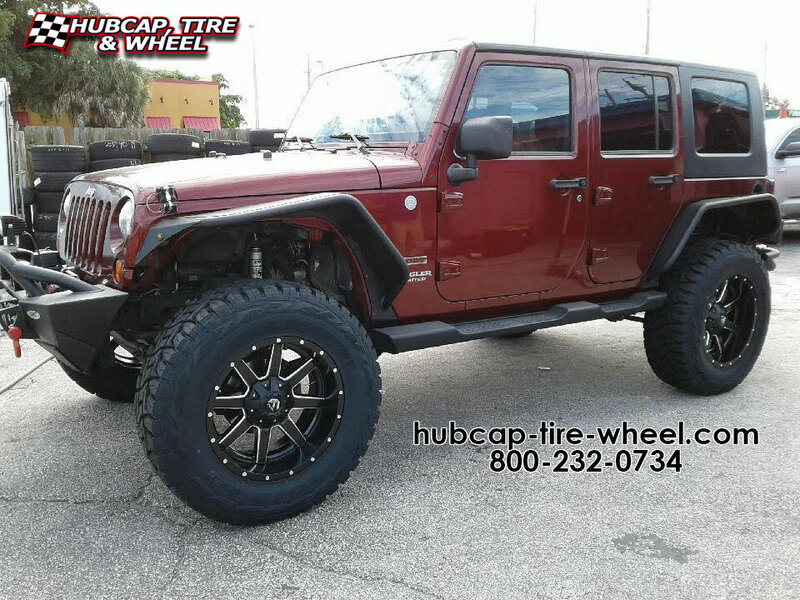 You can also go to our main site: hubcap-tire-wheel.com and use the contact us button at the top of every page and we will email you back as soon as possible. We also have social media. You can message us on Instagram, Facebook, Google +, and Pinterest. We want you to have the best bang for your buck. Our wheel and tire experts have been in this business combined for over 100 years. They know what they are talking about and we back it up as well. We offer a guaranteed fitment or your money back. The only thing you should have to worry about is which style of wheels and tires you want. Let our experts worry about the bolt patterns and offsets to make sure you get what you want.